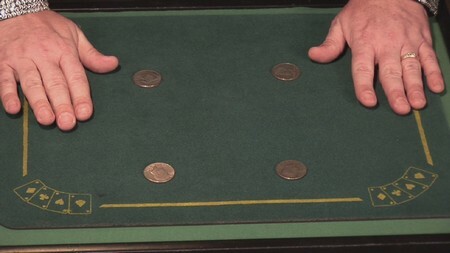 A coin prediction trick is a fairly easy and uncomplicated magic trick. Just a couple of simple and unproblematic steps will have your friends and family marvel upon your magical mind reading capabilities. For this magic trick, you will first and foremost need ten coins of the denomination of your choice. But note that all these coins that you choose should be each of a different year. Arrange for a cap or any small basket to keep the coins in. When you are finished with the preparations, assemble you audience. You may even proceed to perform the magic trick in front of just one person. Make your audience check all the coins so that they are sure of the authenticity and know that the coins feel similar, only difference being their respective years of manufacture. Now ask any one person to check the cap and ensure that it is empty. After this, ask this person to take all the ten coins and put them in the cap and choose one. Make sure that you are looking in a different direction when the person chosen does this. Now ask your volunteer to note down the year of the coin in his mind and also show it to the audience so that the whole audience knows what the year is. After this, ask the person to hold the chosen coin very tightly in his hands and think about the coin’s year very hard. Now tell your audience that you will be predicting the coin’s year of make by magical mind reading. Pretend to concentrate hard for a few minutes, as if struggling to read minds. Do this for a few seconds, and then inform your audience that you have succeeded in reading the volunteer’s mind by magic and you know about the chosen coin. Now tell the person to keep the chosen coin back in the cap and mix all the coins. Now comes the step when you predict with magic the coin that had been picked out of the cap. The basic answer to this magic trick is time. You have to act very promptly. When you were supposedly reading your volunteer’s mind and he held onto the coin tightly, the coin would have warmed up in his hands while the other coins remained in the cap at room temperature. Now, quickly take the cap from the person and start searching for the coin. You will easily get hold of the chosen coin for it will be much warmer than the other coins. If you have a large audience, you may even try a variation, which is to pass the chosen coin along to every member of the audience for a view of the date. The coin will get heated up as it passes in so many hands. This variation is good for children’s birthday parties for the whole audience gets involved. The basic purpose of this magic trick is to have lots of fun. You will be astonished to see people getting impressed by your supposed mind reading abilities.